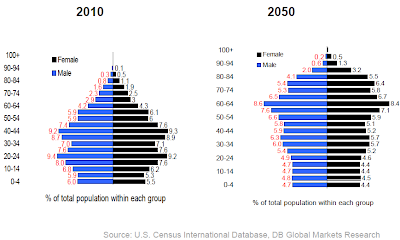 Global demographic projections show divergence in labor force growth among world's major economies. We know that Japan's labor force is on a steady decline. The US labor force is expected to increase at a fairly constant pace, supporting a re-emerging manufacturing base. China's labor force on the other hand has been rising until recently but has now peaked and is expected to decline going forward. 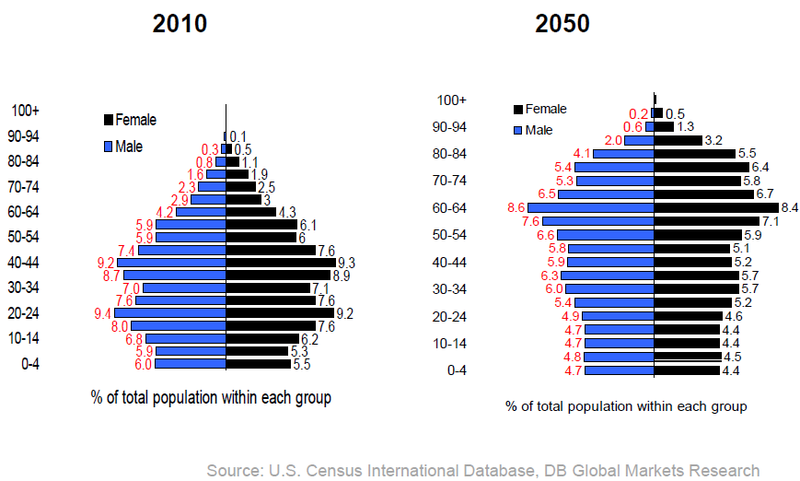 The one-child policy has had a profound impact on China's demographics, resulting in a "top-heavy" population age structure (not as bad as Japan, but certainly visible). What's more, it caused a gender imbalance among the younger generations. Traditional families faced with one-child limitation, "chose" to have boys - something China is desperately trying to correct. 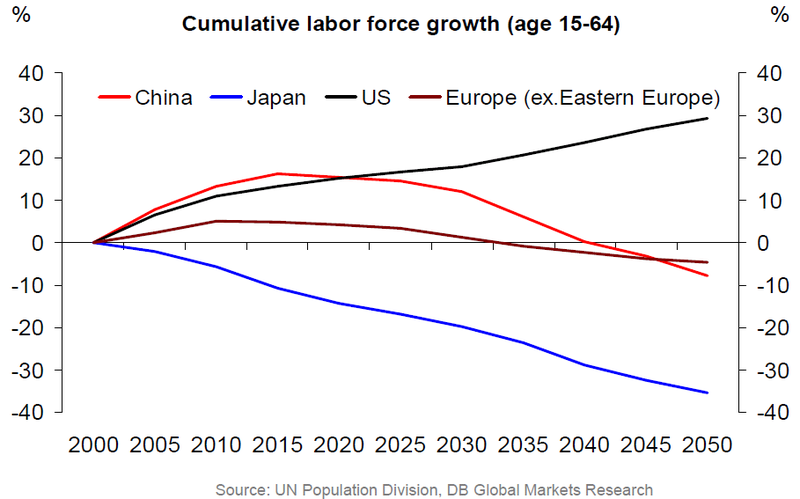 Clearly this decline in labor force is inconsistent with the 7-8% GDP growth targeted by Beijing. This is particularly difficult given China's "labor-intensive" massive manufacturing base. To deal with this issue, China is looking for creative solutions. One of them is immigration - something that allowed the US for example to maintain growth for generations. And who is willing to come to China to work in a factory? The North Koreans of course. Chosun.com: - China is issuing work visas for 20,000 North Koreans so they can work in three northeastern provinces of Jilin, Liaoning and Heilongjiang. The move comes amid a crackdown on illegal North Korean migrants who typically drift into menial jobs, but a diplomatic source in Seoul said the three Chinese provinces now decided to legally hire 20,000 North Koreans for jobs there in a bid to ease a labor shortage. To achieve this targeted growth over time, immigration may become Beijing's core policy, opening its borders to North Korea as well as other impoverished nations. 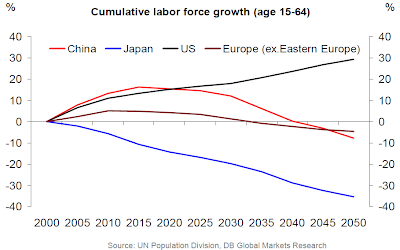 It may be the only way to plug the generational holes created by the one-child policy and ease the growing labor shortages.